It reaches every part of the face. 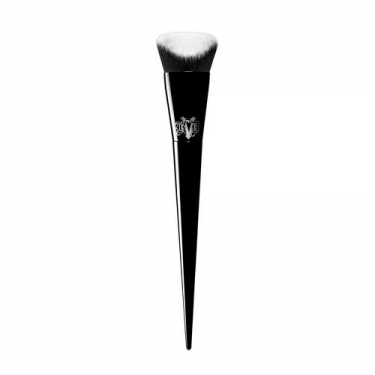 DESCRIPTION: Lock-It Edge Foundation Brush from Kat Von D is a high performance base brush with a unique sculpted shape for precision from all angles. This unique and custom brush design features a sculpted shape that conforms to the unique curves and contours of the face. The perfectly symmetrical conical bristles of the brush and consistent density allow you to reach every corner of the face from all angles for 360 degrees of accurate and uniform blending. Designed for high-performance formulas, the Lock-It Edge Foundation Brush brings the best of the foundation for optimal coverage, wear and finish. The excellent quality synthetic bristles perfectly blend the skin base for a constructive, medium to full coverage.